A traditional hill sheep farm set on a South facing slope, close to the village, road, railway station and wheelchair accessible bridle paths. Converted barn, cow byre and pigsties surround courtyard with gardens, garden furniture. BBQ and covered car parking. 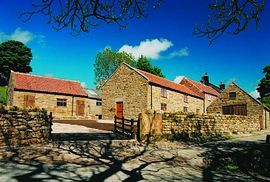 Accommodation is in four cottages, accessible to all, with ground floor bedrooms and adapted shower rooms, natural slate york stone paving, non�slip floors, under floor heating and fully equipped adapted kitchens. All the cottages retain evidence of their original function, for example, the stone troughs in the pigsties. A cot and high chair are available if required. All cottages have wide doors to all rooms. 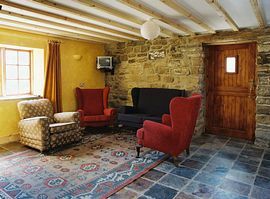 In addition, there is an accessible communal lounge, games room with open log fire for groups to get together. There is a TV, video player, DVD player, Hifi and a selection of games, books, tapes, CDs and DVDs. The barn was part barn, part milking parlour and part granary, now it is the largest cottage with three double bedrooms ( two are upstairs). The bathroom has grab rails, vanity basin with lever taps, level floor shower area with seat. The kitchen has different height work surfaces, inset bowl with lever tap and is equipped with full size cooker with oven, fridge, freezer and microwave. This is the newest cottage and was the main milking parlour. It is spacious ground floor accommodation. The bathroom has roll -in shower (thermostatically controlled), vanity basin with lever taps, grab rails and Clos-o-mat toilet. There is a well equipped kitchen with different height work surfaces, built in oven, hob and extractor, sink with lever tap, fridge/freezer, microwave, with dining and lounge areas. There are two ground floor bedrooms, a double and a twin. The four pigsties are now two small cottages, each with a mezzanine. 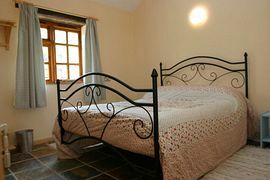 The pigsties are completely accessible on the ground floor, with roll � in shower room toilet, with grab rails, vanity basin with lever taps, downstairs double bed and twin beds on the mezzanine. The kitchens are well equipped with different height work surfaces, with hob and basin set in, lever tap, combination microwave-grill-oven and fridge. This is a working family farm, which was bought by the family in 1900. Livestock includes sheep, pigs, free range hens and a fold of highland cattle, not forgetting Nell, our sheep dog. We are also part of a conservation scheme, with plantings of oak trees and wildflower meadows. We have discovered rare orchids and other species of wild flowers, since we excluded sheep from our woods. Throughout we have created wheelchair accessible footpaths and picnic sites in woodland, meadow and stream side areas, so that all the family can enjoy the tranquillity of the countryside. The area is rich in wildlife including deer, rabbits and other small animals, also a wide variety of birds and wild flowers. The sea is just 7 miles away. A safe place for children to play. Level access to cottages. 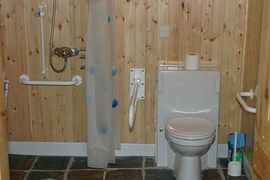 Ground floor bedroom, wheelchair accessible bathroom with wet floor shower and seat. A wheel – in shower chair and toilet riser seat are also available. Commondale railway station is 200 yards away. By car, from the A1M follow signs to Teesside, on to the A19 to the Stokesley turn off. After 8 miles, take the 3rd turning off the roundabout, to Great Ayton, then 1st turning right to Kildale. Continue, through Kildale for 9 miles to Commondale. At the Cleveland Inn, turn right. Fowl Green Farm cottages are at the roadside 500 yards on your left. 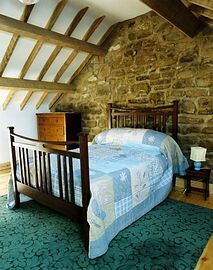 The Barn from: £380 - £540. The Cowbyre from: £320 - £480. The Bottom Pigsty from: £240 - £360. The Top Pigsty from: £160 - £240.